The suspected cause of my tularemia infection was never really known. I was 20 years old and worked as a nurse in a hospital in Alabama back in 1981. I was diagnosed with bacterial tularemia back in 1981. One day I woke up feeling weak, no energy, no appetite, and stayed in bed the whole day. This went on all week, sleeping, not eating or really drinking much fluids. Second week, I got worse, chills, fever 104, and no urge to urinate. I had to be picked up and put in car to go to the doctor's office. They catheterized me, and the urine was dark brown and thick. After hospital admission to MICU, started having all kind of joint pain, stiffness, shortness of breath if I talked, with tachycardia, and couldn't do anything for myself. I had chills and fever of 106, was on a cooling blanket first two or 3 weeks. I was unable to move my fingers, legs, just hurt too badly. I developed chest pain (pericarditis). I was given a different diagnosis almost each day, (crippling arthritis, mononucleosis, cancer). I had an unnecessary surgery (doctors were certain that sonogram showed an abdominal mass which they did not find). I was 20 years old and they had planned to do a total hysterectomy. I had the strangest and worst pain ever (but no stomach pain) that I couldn't put into words. I had different rashes off and on during my hospital stay. I think I had every test and procedure there was. I was allergic to most of the antibiotics given, received blood transfusions almost every day. The biggest problem was obtaining blood to send off to different labs to get diagnosed for correct antibiotics to treat. So it took about 3 weeks to finally get a correct diagnosis. I started receiving IM (intramuscular) antibiotics twice a day. Sorry, this was so many years ago, not sure which antibiotic was used in the end. I was told this was the first case in the South. I was interviewed by a roomful of doctors and interns almost every day that I was in the hospital. The CDC called me a couple of times after I was discharged; was too weak to really talk but answered their questions best as possible. I have suffered with severe to moderate joint pain and episodes of weakness ever since. I am 59 year old now. I was recently diagnosed with tularemia, and I believe I contracted it by a tick bite. I have also tested positive to 3 other bacteria using the Western blot test. I am being treated by IV gentamicin for 14 days. I am hoping it works. I have had skin lesions for almost 14 years and no other doctor could diagnose or find anything to treat it. I am also a type I diabetic, so my immune system is weak. I touched a bunny found in my back yard by my young son. The next day or so I developed a rash at my left eye area and seemingly spread to chin/neck. It is itchy and I have swelling of eye area, not in eye but around it is the worst. Doctor is treating with steroids, but wondering if I need antibiotic. There are no other notable symptoms of tularemia infection. 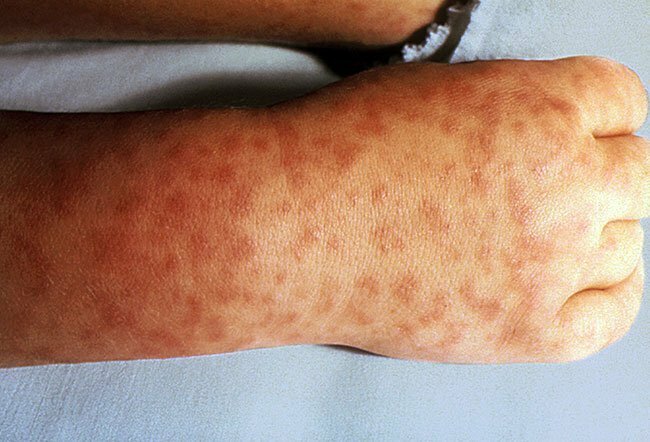 Please describe signs or symptoms associated with tularemia. If you were diagnosed with tularemia, please discuss your treatment with streptomycin or gentamicin.